Reproduction of the Prusian Order of the Red Eagle 3rd Class, the badge was a gold cross pattée, enameled in white; the central disc bore the red eagle on a white enamel background on the obverse, with the royal cipher of King Friedrich Wilhelm surmounted by the Prussian crown on the reverse. The Order of the Red Eagle was an order of chivalry of the Kingdom of Prussia. It was awarded to both military personnel and civilians, to recognize valor in combat, excellence in military leadership, long and faithful service to the kingdom, or other achievements. 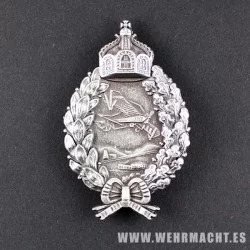 As with most German orders, the Order of the Red Eagle could only be awarded to commissioned officers or civilians of approximately equivalent status. However, there was a medal of the order, which could be awarded to non-commissioned officers and enlisted men, lower ranking civil servants and other civilians.